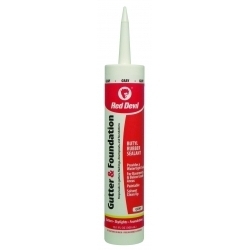 Gutter and Foundation Butyl Rubber Sealant is a high-quality, long-lasting formula that is ideal for outdoor jobs requiring a durable, watertight seal. It can be used around concrete foundations and expansion joints, on gutters and in below-grade areas such as basements. Cured sealant is mildew resistant.